Workers are putting the finishing touches on the new Hampton Inn. 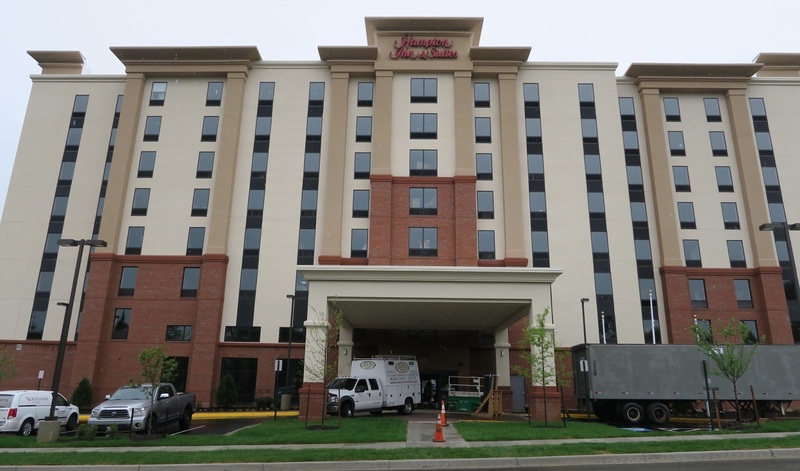 The new Hampton Inn & Suites on Route 50 in Seven Corners is set to open on June 7. The nine-story hotel, at 6430 Arlington Boulevard, has an indoor heated swimming pool, 24-hour fitness center, a meeting room with space for 70 people, free wi-fi, a 24-hour business center, and free parking. There are 159 guest rooms, including 15 suites. “It’s surprising to see how many rooms have been booked already,” says Carmen Edmonds, the hotel’s sales director. She predicts guests will be evenly split among D.C. tourists and business travelers. Room rates listed on the hotel’s website for early June range from $116 to $165. The rate includes a full breakfast and shuttle service. All rooms have an LCD TV, microwave, refrigerator, and coffee maker. 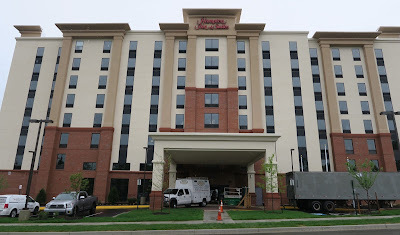 “We hope to be a strong asset to the community,” Edmonds says, noting that the hotel has already joined the Falls Church and Northern Virginia chambers of commerce. The hotel is managed by Baywood Hotels and is part of Hilton Worldwide’s Hampton by Hilton brand, which the company describes as “the global mid-priced hotel brand that serves value-conscious and quality-driven travelers.” There are more than 2,100 Hampton Inn & Suites and Hampton by Hilton properties. A press release tout’s the Hampton by Hilton culture, “hamptonality,” which refers to friendly customer service, anticipation of guests’ needs, and helpful suggestions about area attractions. the Inn sites atop Route 50; was it built to be soundproof?